Ever wondered how to share your EVDO connection with multiple users using WiFi? This can be easily done using an EVDO Wireless Router. 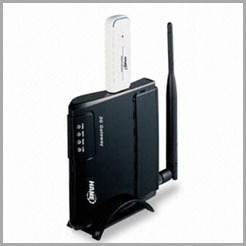 The USB modem will be connected to the device as shown in the images. No software or drivers are necessary. The router will directly dial and establish the connection which you can access from your laptop using WIFi. The problem with EVDO is that the signal may not be strong everywhere thereby reducing the speed. You can position this device at a location where the signal is great for example in the balcony and access the internet at good speeds from anywhere in the house. 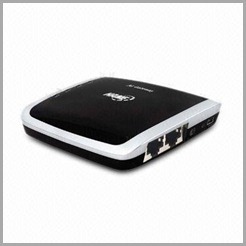 Now this product is available in India for a price of Rs 4999 for the HM-432R model and Rs 5499 for the second HM-433R portable model which can be powered directly from your laptop’s USB port.